After examining telemetry, Russian engineers concluded the glitch was caused by low temperatures in electronic gear associated with the new antenna. Tests showed that activating the components earlier than usual and allowing them to warm up longer would fix the problem. 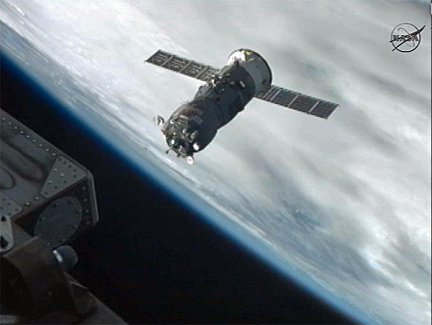 After station keeping while a Japanese cargo ship was captured by the station crew Friday, the Progress approach was re-initiated. Veteran station commander Gennady Padalka and Yuri Malenchenko, two of the world's most experienced cosmonauts, were standing by in the station's Zvezda command module, ready to remotely take over manual control if any problems developed during final approach. But this time around, there were no problems and the KURS-NA antenna worked properly, locking on to navigation beacons that helped guide the Progress M-15M spacecraft to the Pirs docking compartment for a linkup at 9:01 p.m. EDT (GMT-4). Starting in 2014, the Russians plan to implement the new KURS-NA system on operational spacecraft, using the new antenna in place of four in the current system. With the re-docking test complete, the station crew plans to jettison the Progress M-15M spacecraft for good on Monday, clearing the way for launch of another Progress, the M-16M spacecraft, at 3:35 p.m. EDT Wednesday. In yet another test, the Russians plan to implement an abbreviated four-orbit rendezvous, shortening the normal two-day approach to less than one day, setting up a docking at the Pirs module around 9:24 p.m., five hours and 49 minutes after launch. The goal of the test is to check the feasibility of shortening manned Soyuz rendezvous procedures to minimize the amount of time crews have to spend cooped up in the cramped ferry craft.